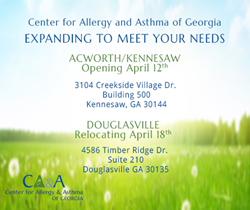 The Center for Allergy and Asthma of Georgia is now accepting appointments for their new Acworth/Kennesaw office (opening April 12, 2016) and their relocated Douglasville office (opening April 18, 2016). The Center for Allergy and Asthma of Georgia is pleased to announce that we will be opening a brand new office location in Acworth/Kennesaw to better serve the needs our patients. We are also relocating our Douglasville office to a new building in the Prestley Mill Medical Center. The locations will open April 12 and April 18, 2016, respectively, but we are currently accepting advance appointments. There is no wait for appointments! Our expansion and relocation will help our patients receive the high quality and comprehensive sinus, allergy, and asthma care they have come to expect from our practice at a location close to home. If you are seeking immediate and lasting relief of your allergy, asthma, and sinus symptoms, please contact the Center for Allergy and Asthma of Georgia to request an appointment with a Board Certified Allergist. The Center for Allergy and Asthma of Georgia treats patients suffering from allergies, sinus issues, skin issues, lung/pulmonary issues, GI complaints, and asthma from eight convenient locations throughout Georgia. Book your appointment with a Board Certified Allergist online or by calling (404) 994-3574. The Center for Allergy & Asthma of Georgia, P.C.